A full range of media resources will be available to assist in your coverage of the American Chemical Society Spring 2019 National Meeting & Exposition, whether you are reporting onsite or from a remote location. There will be press releases and press conferences on abstracts chosen from nearly 13,000 scientific presentations. Watch live press conferences on YouTube here here: ACSLive_Orlando2019 on Monday, April 1, through Wednesday, April 3. (ACSLive_Orlando2019 is case-sensitive.) Anyone can view the briefings, but to chat, you must first sign in with a Google account. Modern chemistry is a multi-disciplinary science, and the Orlando meeting will include newsworthy topics spanning science's horizons. Thousands of scientists and others from around the world are expected to attend. Reporters: Please log in for more information. Showing releases 1-21 out of 21. Purdue University researchers have developed a method that uses the protein Argonaute from Natronobacterium gregoryi (NgAgo) and supplied DNA for gene editing. Science-fiction writers have long envisioned human-machine hybrids that wield extraordinary powers. However, 'super plants' with integrated nanomaterials may be much closer to reality. Today, scientists report the development of plants that can make nanomaterials called metal-organic frameworks (MOFs) and the application of MOFs as coatings on plants. The augmented plants could potentially perform useful new functions. The researchers will present their results today at the American Chemical Society Spring 2019 National Meeting & Exposition. Lead leaching from pipes into the water supply is a serious public health concern. If water sources or treatments are changed, the new chemistry can cause previously safe water distribution systems to begin releasing lead, as the crisis in Flint, Mich., demonstrated. Today, scientists will describe a rapid, cost-effective method to overcome these problems and make lead pipes safe. They will present their results at the American Chemical Society Spring 2019 National Meeting & Exposition. Hundreds of everyday items, from furniture to cell phones to floor wax, contain organophosphate ester (OPE) flame retardants and plasticizers. Some of these compounds make their way into the air, onto surfaces and even inside our bodies, with uncertain health effects. Today, researchers report that hands play a central role in transferring OPEs throughout the indoor environment. The researchers are presenting their results at the American Chemical Society Spring 2019 National Meeting & Exposition. Nature has evolved protein-based substances with mechanical properties that rival even the best synthetic materials. Pound for pound, spider silk is stronger and tougher than steel. But unlike steel, the natural fiber cannot be mass-produced. Today, scientists report a method in which bacteria produce spider silk and other proteins that could be useful during space missions. The researchers will present their results today at the American Chemical Society Spring 2019 National Meeting & Exposition. Just as controlled-release medications slowly dole out their cargo after they experience a pH change in the body, implanted 'artificial muscles' could someday flex and relax in response to light illuminating the skin. In pilot studies, scientists have developed a new material that expands and contracts, lifting a weight merely by shining a light on it. The researchers will present their results today at the American Chemical Society Spring 2019 National Meeting & Exposition. From computer hard discs to smart phones, magnets are at the forefront of technology. Magnets containing rare-earth elements are among the most powerful available, but these elements can be difficult to obtain. Now, scientists have identified magnets based on more readily obtainable rare earths, as well as some promising magnets that don't contain these materials at all. They present their findings today at the American Chemical Society Spring 2019 National Meeting & Exposition. Major depression, obesity and chronic pain are all linked to the effects of one protein, called FKBP51. Researchers have now developed a highly selective compound that can effectively block FKBP51 in mice, relieving chronic pain and having positive effects on diet-induced obesity and mood. The new compound also could have applications in alcoholism and brain cancer. The researchers will present their results today at the American Chemical Society Spring 2019 National Meeting & Exposition. Drawing inspiration from nature, researchers are making polymers with ever-more precise compositions on demand. Using multistep synthesis tools pulled from biology, a group is reporting that it is developing ultra-high precision synthetic polymers with precisely controlled chain lengths and monomer sequences. The resulting macromolecules can be deployed for data storage, anti-counterfeiting and traceability technologies. The researchers will present their results today at the American Chemical Society Spring 2019 National Meeting & Exposition. If you've ever dreamed about getting a good night's sleep, your answer may someday lie in data generated by your sleepwear. Researchers have developed pajamas embedded with self-powered sensors that provide unobtrusive and continuous monitoring of heartbeat, breathing and sleep posture -- all factors that play a role in how well a person slumbers. The researchers will present their results today at the American Chemical Society Spring 2019 National Meeting & Exposition. There's nothing like a glass of orange juice to start the morning, but prices have soared as the Florida citrus industry fights a citrus greening disease epidemic that has been drying out juice oranges and reducing crop yield. There's no cure, but researchers report that they have identified a fungal compound that may inhibit the causative bacteria. The researchers will present their results today at the American Chemical Society Spring 2019 National Meeting & Exposition. Freshly distilled, un-aged whiskey is filtered over charcoal made from the sugar maple tree in a mysterious, but necessary step known as the Lincoln County Process. By law, a product cannot be called Tennessee whiskey without it. Researchers now say they have some clues as to what the process imparts to the final product. The researchers will present their results today at the American Chemical Society Spring 2019 National Meeting & Exposition. Aiming a laser beam at an aircraft isn't a harmless prank: The sudden flash of bright light can incapacitate the pilot, risking the lives of passengers and crew. Today, researchers report liquid crystals that could someday be incorporated into aircraft windshields to diffuse any wavelength of laser light. The researchers will present their results today at the American Chemical Society Spring 2019 National Meeting & Exposition. As current antibiotics dwindle in effectiveness against multidrug-resistant pathogens, researchers are seeking potential replacements in some unlikely places. Now a team has identified bacteria with promising antibiotic activity against known pathogens -- even dangerous organisms, such as the microbe that causes MRSA infections -- in the protective mucus that coats young fish. The researchers will present their results today at the American Chemical Society Spring 2019 National Meeting & Exposition. Fentanyl's powerful effects are long-lasting, and even tiny amounts of the drug can lead to an overdose. Antidotes, such as naloxone, do not last long enough in the body to fully counter the drug, requiring repeated injections. Now, scientists report that they are developing single-dose, longer-lasting opioid antidotes using polymer nanoparticles. The researchers will present their results today at the American Chemical Society Spring 2019 National Meeting & Exposition. 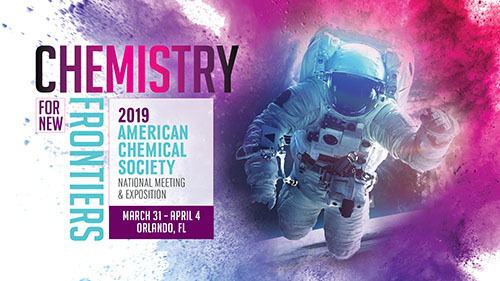 Journalists who register for the American Chemical Society's (ACS') Spring 2019 National Meeting & Exposition in Orlando will have access to nearly 13,000 presentations on the meeting's theme, 'Chemistry for New Frontiers,' and many more topics, including food, nutrition, medicine, health, space science, energy and the environment. The meeting, one of the largest scientific conferences of the year, will be held March 31-April 4 in Orlando. Journalists may now apply for press credentials for the American Chemical Society's (ACS') Spring 2019 National Meeting & Exposition, one of the largest scientific conferences of the year. The meeting will be held March 31-April 4, 2019, in Orlando. Sensing human activity with smart garments and the chemistry of searching for extraterrestrial life will be the topics of a pair of Kavli Lectures at the spring 2019 National Meeting & Exposition of the American Chemical Society, the world's largest scientific society. The meeting will take place March 31-April 4 in Orlando, Florida.